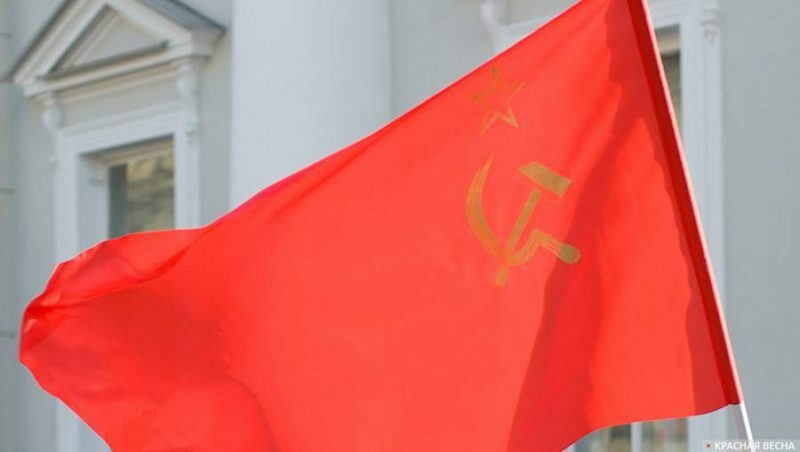 Ukrainian radicals attacked an elderly woman carrying a red flag, and the men who tried to protect her, at the Immortal Regiment event in the center of Kiev on March 9, TASS reports. The elderly woman, who was participating in the Immortal Regiment event, was marching with a red banner. Ukrainian policemen asked her to put the flag away because they said its demonstration violated the so-called Decommunization Law. The woman refused to do so, and she told the law enforcement officials that the flag had no symbols, especially the communist ones, which are banned. After that, two nationalists forced their way into the moving Immortal Regiment column, and they started tearing the red flag from the woman’s hands. Some participants of the march came to her defense, and one of them was beaten by the attackers. Police detained both of the attackers. The victim received medical aid. According to the Ukrainian police, seven people had been detained by 11 AM for using the banned communist symbols in Ukraine. The so-called Decommunization Law was passed by the Verkhovnaya Rada (the Ukrainian Parliament) on April 9, 2015. The Law prohibits Soviet names of cities and streets, Soviet memorials, and communist symbols. Ukrainian radicals regularly attack those who bear any Soviet symbols, including on Victory Day. In the two previous years, for example, nationalists in Kiev have also attacked the Immortal Regiment column. This entry was posted in News from Ukraine and tagged Bandera Nazism, Immortal Regiment in Russia and abroad, Ukraine, Victory Day, War Against History. Bookmark the permalink.